At the cusp of NASA's first moon mission, the 1964 World's Fair in New York City inspired thousands of young people to study math and science and pursue careers in engineering. IBM's exhibit at the Fair -- Mathematica: A World of Numbers...and Beyond -- encouraged future generations to appreciate math and create the next generation of computing. 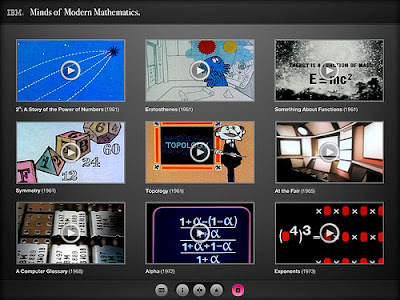 To mark the impact of math on the world and pay tribute to the 1960s-era exhibit, IBM has created an iPad app, Minds of Modern Mathematics, available for free (and ad-free) at the App Store. The Mathematica exhibit was created by famed husband-and-wife design team Charles and Ray Eames, and the app is being released during the centennial year of Ray Eames' birth. IBM designed the app together with the Eames Office, which works to preserve the legacy of Charles and Ray Eames. The iPad app is a vintage-meets-digital interactive recreation of the massive 50-foot-long timeline poster from IBM's World Fair exhibit that traces hundreds of artifacts, milestones and giants of math from 1000 AD to 1960. For students, teachers, and tech fans of all ages, the app illustrates how mathematics has influenced advances in art, science, music and architecture. Users can click through more than 500 biographies, historical achievements and images culled from the original Mathematica exhibit as well as a high-resolution image of the timeline poster. The app also includes a collection of short films, known as the "IBM Mathematics Peep Show," produced by the Eameses. It's a series of playful two-minute animated lessons on mathematical concepts, from exponents to symmetry. Mathematics remains essential to IBM's technological innovation. As demand grows for real-time analysis of information gathered from sensors in roads and power grids and other sources of "big data," IBM mathematicians are working on everything from the Jeopardy!-winning computer Watson, to astrophysics, weather forecasting and genomics, to easing traffic congestion and power consumption in cities around the world. IBM, which maintains the largest mathematics department in industry, expects the app to be used in classroom settings and beyond to spur interest in education and careers around STEM (science, technology, engineering and math). 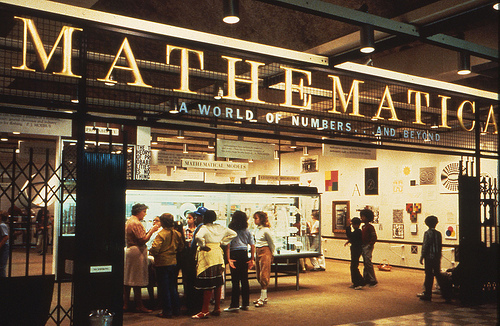 So what happened to IBM's original Mathematica exhibit? It is still on display at the New York Hall of Science in Queens, NY, and the Museum of Science, Boston. A smaller-scale poster is still on the walls of hundreds of schools and universities around the world and stands as an example of IBM's and the Eames’ vision for interactive learning and design.